SAN BERNARDINO, California — A federal judge ruled Tuesday that Nestlé can continue to bottle water from drought-stricken Southern California, even though the permit which allows the company to pipe water from the San Bernardino National Forest expired in 1988. “Plaintiffs do not identify and the Court cannot find any authority holding that an agency’s failure to act within a reasonable time can invalidate before it is finally determined by the agency,” Judge Bernal wrote. In other words, since Nestlé attempted to renew the permit, it remains in effect until the Forest Service tells the corporation it is invalid. The expiration date is irrelevant. “We are disappointed – very disappointed – in the ruling,” said Michael O’Heaney, executive director of The Story of Stuff Project, a movement to raise awareness about the dangers of consumerism, and one of three co-plaintiffs in the lawsuit, in a Sept. 21 interview with The Desert Sun’s Brett Kelman. O’Heaney launched the lawsuit against the Forest Service in October 2015, along with Courage Campaign Institute and the Center for Biological Diversity. “The idea that 28 years in inaction on the Forest Service’s part is considered reasonable, and perfectly fine with the court, is outrageous,” O’Heaney continued. 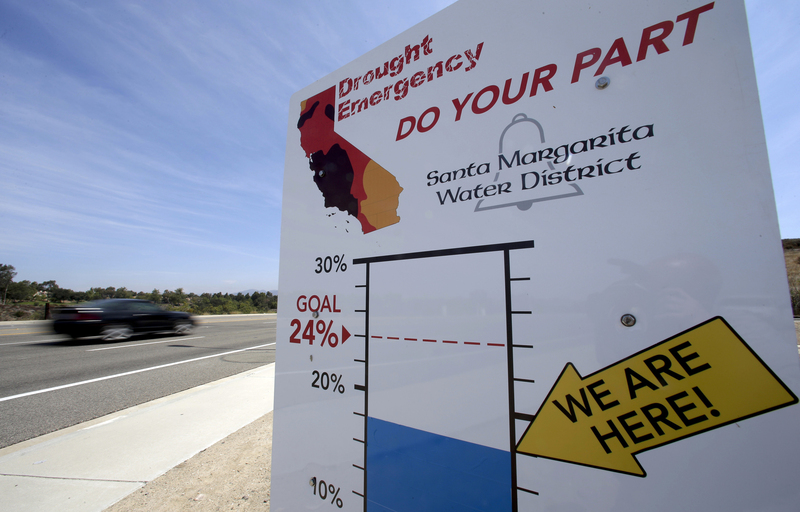 Cars in Rancho Santa Margarita, Calif., drive by a sign encouraging residents to save water, July 2, 2015. The lawsuit did prompt the Forest Service and the state water board to reexamine the issue of Nestlé’s water usage, but the proposed solution is unlikely to ease environmentalists’ concerns about the ongoing impacts of piping water from a national forest. “The agency has proposed to issue a permit that would allow Nestle to continue operating its wells and water pipelines in the forest for five years, and the permit process is to include environmental studies,” Kelman noted. The new permit would not be issued until an environmental study is completed, a process that could take up to two years, and Judge Bernal’s ruling means it’s likely that water will continue to be bottled during that time. Environmentalists in Canada are also fighting Nestlé’s water bottling in their region. Last month, The Globe and Mail reported that Wellington Water Watchers was urging the government not to renew permits allowing the company to bottled water from Aberfoyle in southwestern Ontario. Nestlé Water’s permit, set to expire on July 31, was instead granted an automatic extension.